It's the thrill of a lifetime for most people to get to ride Tevis once. How about ten thrills of a lifetime? That's the number of times Barbara White has been pulled at Tevis. And even then, Barbara never regretted a minute of the rides. Twenty-eight Tevis buckles. Twenty-eight times she's successfully guided a horse - some she knew well, some she didn't know at all - over the mostly same challenging hundred miles of trail from the start near Truckee to the finish line in Auburn, California, year in and year out, only missing three years since she rode in her first Tevis at age 19, in 1967. "I was thrilled to be there!" she said of her first try. 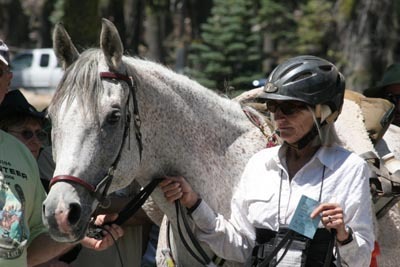 Though Barbara and her horse were pulled at 80 miles, that just energized her to try again. She went out the next year more prepared - she pre-rode the trail with the same horse; and they finished - her first Tevis buckle on a long trail littered with silver. And she still feels the same way about the ride that's become an institution in her life. Why does she do it? "It's an honor to ride it. I really really love the ride. It's a spectacular trail; I love the bond you have with your horse after a hundred miles; I love the people, the history; and the volunteers are beyond compare - you get spoiled at this ride." While you might be tempted to call her an 'expert' at the ride, she's by no means immune to the excitement of it all. She gets overwhelmed two weeks before Tevis. "That's always the worst time - waiting, packing, trying to think of everything. Both I and my horse are ready; now we just have to wait and hope nothing happens between now and the start." This year she will be riding the same horse that she rode - and finished on - in 2007, The Reverling TGE (Crickett), owned by Dayna Weary. "Dayna kindly loaned him to me the last Tevis (2007), and she's loaned him to me again this year. He's a great little horse, small, he knows the trail, and he has a lot of heart. He has a bit of an attitude, and he's not a quitter. I felt he was never tired in '07 at all." And even though she enjoys the ride more now, she still gets nervous at the start - "My nerves calm down once we get going down the trail" - and, understandably, at the vet checks. It's hard not to be nervous at the vet checks: "I've been pulled at just about every place you can be pulled," so it all just depends on your horse, and you, and Lady Luck on the given day. Even 28-time finishers are battling against the same finishing percentages. When Barbara is not riding the Tevis trail, she's involved in that other 100 Miles One Day Western States event: the Endurance Run, those crazy men and women who actually run, on foot, the Tevis trail. "I felt bad about only riding Tevis and never helping, so 9 years ago I started helping at the Run aid station. Those people are great too - many help in both the run and the ride, and they work on the trails together." Two who will be anxiously waiting for Barbara at the finish line will be her parents, Bob and Julie Suhr. You can be sure from where Barbara gets her obsession with endurance horses, and the Tevis Cup. 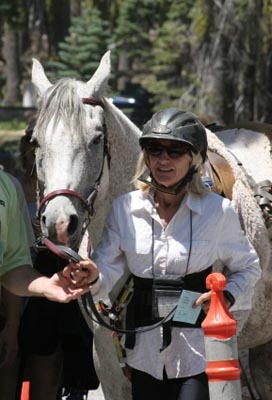 Julie Suhr, considered by many of us to be "the First Lady of Endurance," with almost 30,000 AERC miles to her name (and many, many more around the world - Mongolia, Egypt, Kenya, Botswana, Belize, South Africa, France, Australia), has 22 Tevis buckles, the third most of any obsessed Tevis rider. When Julie finally got her husband Bob up on an endurance horse at age 58 it was in the Tevis Cup (he finished). Bob never looked back, and racked up nearly 15,000 AERC miles of his own (and many, many more around the world with Julie). He likes to tease Julie that while she has more Tevis buckles (22), his record is better than hers: 2 for 2. Julie and Bob are done (well... probably) with riding Tevis, but they still have Barbara's record to discuss. And there's no sign of Barbara's silver buckle quest ending any time soon. And watch for live Tevis coverage August 1 at www.teviscup.org/webcast/main.html, and many photos and stories at www.endurance.net/international/USA/2009Tevis/ a few days after the August 1st ride.